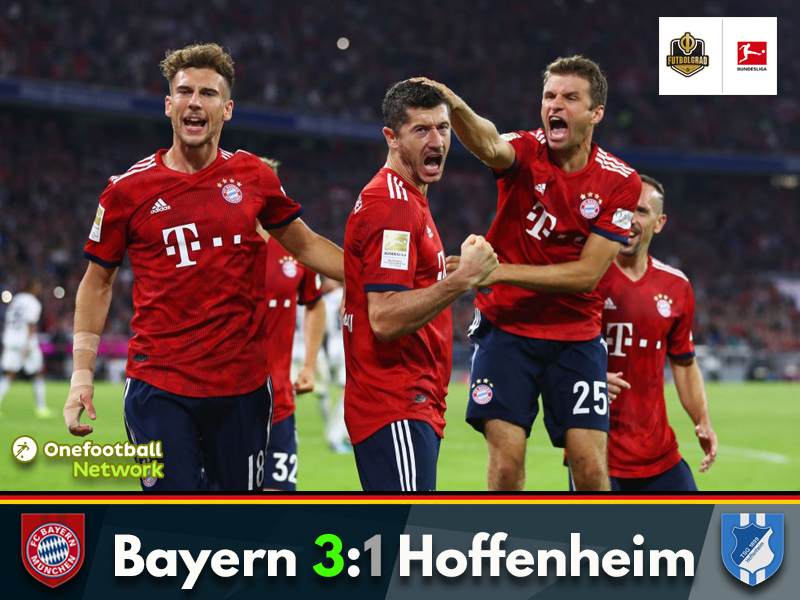 Bayern v Hoffenheim was an emotional affair that despite the clear victory by the Bavarians was a game on the kife’s edge for much of the 90 minutes. Bayern start their title defence with a win. With several players missing for Hoffenheim head coach Julian Nagelsmann had his team sit compactly at the centre of the pitch. As a result, Bayern had much of the possession to start the match but struggled to break down die Kraichgauer. One of the major lessons from the World Cup has been that set pieces have made a big comeback in football. 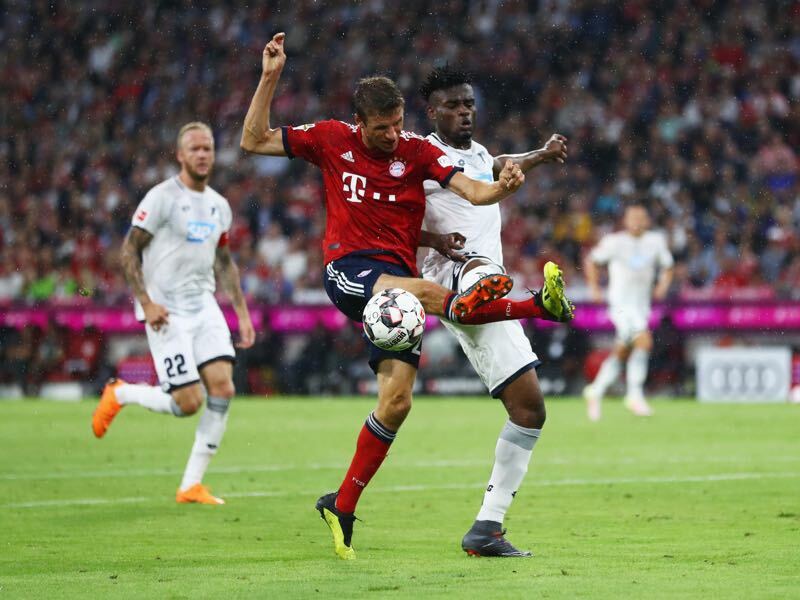 Bayern head coach Niko Kovac had taken note from this trend and in the 24′ minute Thomas Müller nodded home a pitch-perfect Joshua Kimmich corner kick from about six yards out to open the scoring. The goal did not mean a switch in Hoffenheim’s tactics. Hoffenheim still sat deep and remained tactically disciplined but at the same time were also dangerous going forward and in the 33′ minute Joelinton almost scored the equaliser sliding into a low cross by Nico Schulz, but the Brazilian’s finish missed the shot by a whisker. The game then descended from being an interesting tactical battle to a game where both sides tried to find an advantage through a tough, physical game. Hoffenheim, in particular, were trying to disrupt Bayern’s game through repetitive fouls, which led to Kingsley Coman being carried off with a serious ankle injury in the 44′ minute. In the context of Hoffenheim missing key players Nadiem Amiri, Benjamin Hübner, Kerem Demirbay, Lukas Rupp and Dennis Geiger die Kraichgauer had to rely on physical elements to break down Bayern. Grid and determination ultimately led to the equaliser in the 58′ minute. Bičakčić won the ball 25-yards out Hoffenheim worked the ball to Adam Szalai, who broke into Bayern’s area and then beat Bayern keeper Manuel Neuer with a low drive to make it 1-1. At that point, it was a well-earned draw as Hoffenheim were the harder working team without dazzling, however. Without Coman on the pitch, Bayern were a bit predictable and had a hard time breaking down Hoffenheim. Hence, Bayern needed another set piece to find the lead. Ribéry broke through on the left and was brought down by Havard Nordtveit inside the box. Sebastian Dankert gave the penalty, Robert Lewandowski failed to score, and Arjen Robben dispatched the rebound. The penalty, however, was pulled back by VAR Robben encroached into the box too early and Lewandowski then scored the retake. Bayern then had a goal chalked off in the 86′ minute. But the Bavarians kept going nonetheless, and in the 90′ minute Robben wrapped it up with a close-range volley from just ten-yards out. Thomas Müller was the man of the match. The 28-year-old had two difficult seasons and a World Cup to forget. But he got this season started on the right foot scoring the opener and assisting Robben’s goal. Hoffenheim were a difficult opponent to Bayern despite missing several key players. Nagelsmann had his team set up in a compact formation trying to oppose the Bavarians with physical play. It almost worked as for 80 minutes Hoffenheim were Bayern’s equal and perhaps with a more creative element could have walked away with a positive result in Munich. Müller scored his sixth goal on the opening weekend of a Bundesliga season; no other current Bundesliga player has scored more. His teammate Robert Lewandowski also has scored six goals on the opening weekend. For the first time, Niko Kovac beats Hoffenheim.